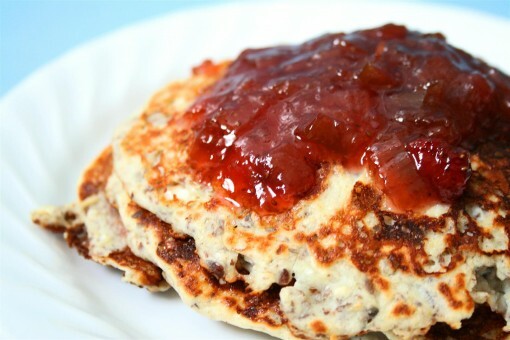 Vanilla Protein Pancakes was posted on August 3rd, 2012 and is filed under Breakfast, Low Carb, Protein, Recipes. This entry has 11 comments. You can follow any responses through the RSS 2.0 Comment Feed. Since July was all about the smoothies, I’m going to switch things up for this month. I’ve been wanting to share this recipe with you for a while. I am so obsessed with protein pancakes. So flipping good (yes, that was a pun). This recipe is especially nice because you can get really creative with toppings – from cut up fruit, syrups, peanut butter and bananas, yogurt, or pureed fruit. It has tons of protein, lots of fiber, and practically no carbs. Serves 1. Heat your non-stick skillet and add a little coconut oil. I used a fork to blend everything together and poured it into the pan. Flip when one side is cooked and do the other. The batter is thin and will make quite a few pancakes. 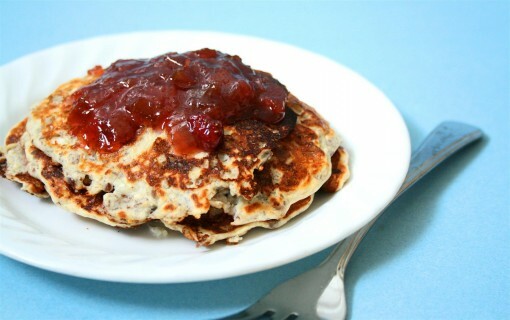 I topped the pancakes with homemade organic rhubarb and strawberry jam. I actually put it in the skillet with a little water (after I made the pancakes) to warm up it up and thin it out for a lovely fruity topping. You can change the texture from a more “melt-in-your-mouth” to a thicker, firmer pancake by omitting the cottage cheese and replacing it with another scoop of protein powder. Well, I’m gone for several days with music touring, so my next post will be a guest post from someone who has some great tips! These sound amazing!!! I love protein pancakes too and I use psyllium husk all the time so I’m excited to see that in your recipe too! Can’t wait to try them! I’m on such a protein pancake kick right now. These sound like another fabulous option to add variety to my own recipe. Thanks! Mmm, these look soo good. Definitely trying them, thanks! I love LOVE protein Pancakes! Yum! Pancake topping: Raspberry Jam. Yum! I haven’t made pancakes in ages. I need to change up my breakfast options though. My family actually had pancakes for dinner on the 4th of July with strawberries, blueberries and cream. I made myself some protein pancakes that evening, too. Love ’em. I must say that blueberries are my favorite pancake topping. I like to make my own blueberry syrup out of them. Fav pancake topping – vanilla yogurt and stewed blueberries. So good. Hi. Just wanted to send you a note of thanks. You posted this on my birthday and incorporated this pancake into my weekly clean healthy eating. I was looking for a way to use my protein powder that seems to sit on my counter forever and not a huge shake person but try to be… Thank you so much for posting. I absolutely love it!! I add on top frozen melted blueberries and greek yogurt on top. Um Yum…. I wasn’t kidding about stalking your page. :) I’m currently printing all kinds of recipes! You are my foodie hero.